The new patch introduces the smart deck builder. Make a new deck, dont put any cards in, click Complete Deck, and it will build the deck with highest win rate from your collection. If you want to build a specific deck, add a seed card or too (like Shudderwock, say, or hex lord Malacross) and it will try to find a deck with those cards that it can build with your collection. 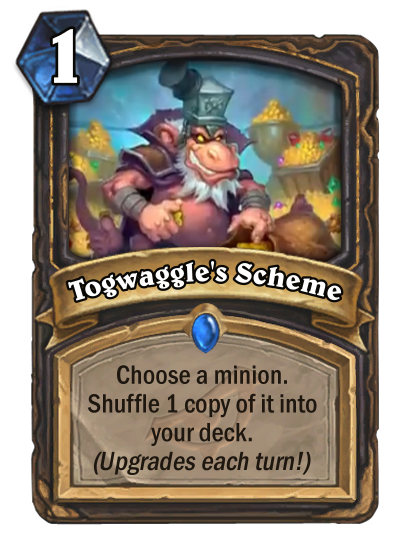 It does do some funny things, like if you add the Rogue Quest, it will build an Odd Rogue that just happens to have the quest. That's because rogue quest with one bad card has a higher winrate than quest rogue right now. So to build specific types of decks you might have to seed it with a bunch of cards. Also, it doesnt work at all for Wild, which I'm sad about. It appears to use the old deck builder, so always produces pretty bad decks that all look alike. Yeah, its pretty good. Mage has been getting some whizbang legendaries this expansion. Also, I just found out, the Fortune Teller is gonna be the new Priest Hero you can get for ordering the 80 dollar bundle. Yeah, but why would they bring an all-purpose beatstick back into the game? The minion meta is significantly different now to what it was in GvG. Boom was a very strong card but much of his omnipresence came down to the fact that, between the speed of the meta and the general shitness of big minions at the time there were almost no curve-toppers worth playing. Now there's options. I don't think they'll straight reprint him simply because it's far more their style to release themed alternatives in a new set but barring some significant support ol Doc ain't the terror he used to be. The new complete-a-deck is fun! I fed the Lady in White and Temporus into it and it spat out... something... that I took into casual. I managed to beat a Resurrect Priest with it, I think by confusing him to death? Good times. Now this begs the question: What is the upper limit of this card? If it adds one more minion to your deck for every turn it's in your hand, there's a hard limit of your deck size, which I think tops out at 60 cards. But that's a limit that effectively will never come into play unless deliberately trying for it. This is true, also the game is limited to 89 turns, but there's nothing built into the schemes that puts a cap on.